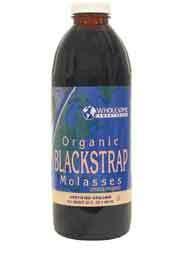 Wholesome Sweeteners Organic Blackstrap Molasses is made from certified organic cane sugar. Grown using sustainable agricultural farming practices, this molasses is a rich source of minerals and is the most nutritious and full-flavored form of molasses. This organic molasses is unsulfurized and processed without synthetic chemicals under strict organic standards. Wholesome Sweeteners Organic Blackstrap Molasses is rich in nutrients such as iron, potassium, and calcium and is grown and produced in Paraguay.